Sri Narayana Guru was a great person who lighted the way to the social reforms in Kerala. He strengthened the movements against the supremacy of the upper castes and for the development of lower castes, who were considered as 'untouchables'. 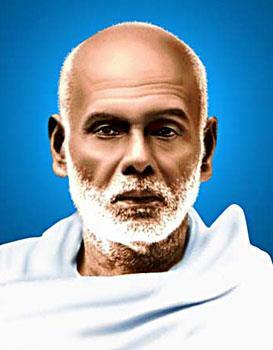 Sri Narayana Guru was born in Chempazhanthi, near Thiruvananthapuram district of Kerala in the year 1856. According to Malayalam calendar he was born to Madan Aashan and Kuttiyamma in the chathayam nakshatra in the Chinga Masam (the Malayalam month). He was called 'Nanu' when he was a child. His lost his mother at the age of 19. A divine power was seen in Nanu when he was a child. He was a scholar in Tamil and Malayalam who also practiced Sanskrit. His education under Varanappilli Raman Pillai Aashan helped him to specialize in Sanskrit. He left his home at the age of 23 and travelled through many places and saw the people of Kerala closer and studied about their miserable lives. His journey made him understand that the present situation of the society of Kerala is filled with malpractices. Young Nanu also strongly believed that only by removing these Kerala could develop. His first step towards bringing change started at Aruvippuram. In 1888 March during the dusk of Shivarathri, in Aruvippuram the first fire of social revolution was lighted. It was enough to remove the darkness of inequality and illiteracy which lead Kerala to walk a long way through the path of kindness and humanity. On this day Sri Narayana Guru placed an idol of Lord Shiva with a stone taken from the river Neyyar. Placing the idol of Lord Shiva by a non-Brahmin made the Nair men there furious. When Guru was sure that this would lead to a hard fight, he calmly replied that the idol he placed was of their Ezhava Shiva. Sri Narayana Guru was lucky to spend his young age with the social thinker Chattambi Swamikal. The endless travelling through the land and studying the problems made Narayana Guru a true hermit. During his journey he had to stay in lonely places and spend time praying in caves. He disliked the ordinary life and so he walked bare footed to temples. Guru attained the peak of divine enlightenment at the age of 30. The words that guru wrote in front of the temple were the magical sounds of social renovation. These words were a relief to the people of Kerala who were fed up with terror of caste and religion. He continued: "Oru jathi oru matham oru daivam manushyanu". Sri Narayana Guru also felt that the malpractices that stayed in Kerala can only be removed by the help of an organization. He formed the Sri Narayana Dharma Paripalanayogam (S.N.D.P) in Aruvippuram. Today S.N.D.P is a well developed organization having many followers and above all works or charity. Guru set up many temples all over Kerala. In 1904 he set up a ashram in Varkala, Sivagiri. In 1914 he laid the foundation stone for the Adhwaithasramam in Aluva and even became famous all over India. The best evidence for this was the visit of Rabindhranath Tagore in 1922 and Gandhiji in 1925. He died on September 20 in the Varkala Sivagiri Ashram. Guru was not only a social reformer he was also a great poet. His famous poems were Aathmopadheshadhashakham, Dhaivadhashakham, Anukambadhashakham and Dharshanamala.